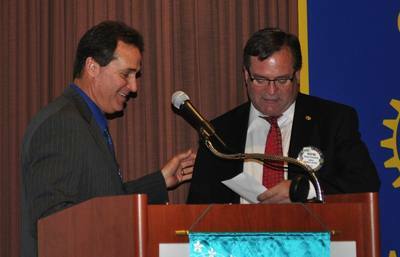 July 1, 2012 to June 12, 2013: Bill Rousseau recalls his year as Rotary president! From Joseph Shaw to William Rousseau, the concept of 92 Rotary presidents is overwhelming. Virtually impossible to imagine thousands of Rotarians united in Sonoma County for a century, in fellowship and dedication to the ideal of service as a basis of worthy enterprise to advance international understanding, good will, and peace through a world fellowship. 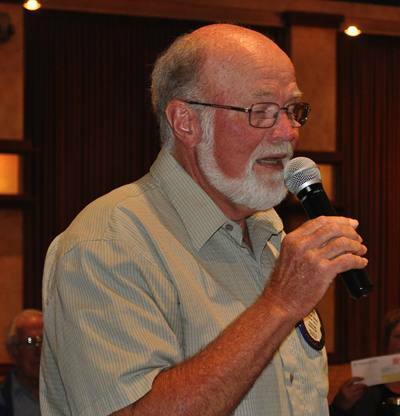 Next Wednesday at a Rotary meeting, President Bill will focus on one year and one Rotary Club as he recalls the great things that we have accomplished together in the most recent of those years. Don’t miss this great opportunity to celebrate a remarkable year. July 3, 2013: No meeting-Celebrate Independence! People grow old by deserting their ideals. 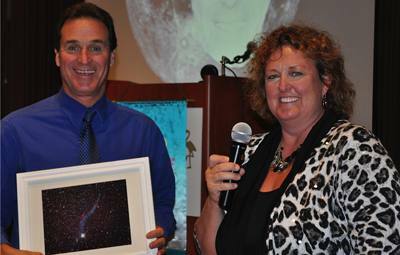 Two visiting Rotarians, here on a mission, are dedicated astronomers. Their mission is to share what has become a consuming passion for them. Linda Sinkay is in insurance and Jim Goodenough is a website designer. As fellow Rotarians they belong to the Rotary Club of Sebastopol Sunrise and both are past presidents of their Rotary Club. 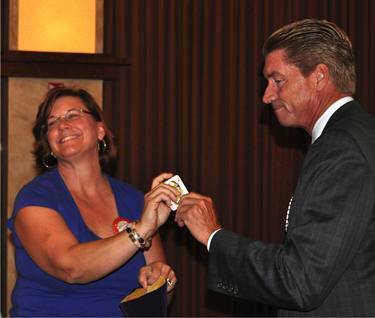 Red Badger Manuela Gonzalez welcomed back her guest, Terry Cox, from Rabobank. Brandon Ulrich, from State Farm Insurance was back for another visit to Rotary and Chuck Reilly, a former Rotary Club member, was back as the guest of Mark Burchill. Carmen Sinigiani introduced her guest from Edward Jones, Jason Black, and Jack Abercrombie welcomed back mortgage banker Carolyn Ivancovich. Please remember our good friend and former Rotarian Carol Cooper in your thoughts and prayers. We received word this week that she is extremely ill and in hospice care. Remember the Rotarians who welcomed you to Rotary this week? Jack Atkin and John Berto were the cheerful guys who greeted you as you entered the ballroom. Two of our newest Rotarians–Red Badgers—were Ann Gospe, adding her smile to the weekly Raffle, and Elizabeth Karbousky, cheerfully selling lunch tickets. And Stephan Passalacqua collecting them. Thanks to Diane Moresi for giving us their names in advance. Thanks to a four-week streak of bad luck by brave Rotarians named Debra, Yale, Tim, and even Ted, the Raffle Jackpot that was raided by “Lucky” Wilmsen” on May 1st had grown back to $149. Red Badge member Anne Gospe announced that the velvet bag contained two jokers and 50 losing cards. Steve Reuter’s lucky ticket was drawn, but it was all for naught as he drew the Queen of Diamonds then slunk away with only $10 in consolation cash. Club Secretary Jack Abercrombie announced that we all should check our individual listings in the club roster that will be printed by the end of June. Biographical listings in the on-line website roster can be changed throughout the Rotary year but printed rosters can be updated and corrected only at the beginning of each Rotary Roster Year—July 1st. Contact Jack immediately to update your roster listings for 2013-14. With only four weeks left before our third annual Giro Bello triple-cycling events through the hills, creeks and valleys of West County, Doug Johnson left for Costa Rica leaving a grumpy Don McMillan holding the bag, trolling for more volunteers to help with set-up & registration on Friday evening, July 5th and Saturday morning, July 6th, at O’Reilly Media. Why don’t you contact Don McMillan, Matt Fannin, Layne Bowen, or Carmen Sinigiani to find out where you can help the most? Not only is pitching in to help essential to the success of Giro Bello, it is our club’s largest and most productive “Hands-on” project in years. While most of Rotary’s active leaders have been deeply involved for months in our Rotary Club’s most effective fundraiser, they could really use your help. It is a great opportunity to get more involved in a variety of ways to be helpful and useful, plus the excitement of being a vital part of the day’s adventures. We could really us your help cleaning up O’Reilly Park on Saturday after 5 pm. President William gave an enthusiastic report on last weekend’s annual District Conference held at the Hyatt Vineyard Creek Hotel & Spa in Santa Rosa, commenting on the depth and diversity of seminars that were presented: Service Projects in a Conflict Zone, the presentation by the French Group Study Exchange Team, the life-changing and highly successful Youth Exchange, with students who are “outbound”, “inbound”, and the “re-bound” students—former exchange students who come back to mentor the new inbound/inbound exchange students. District dues meeting: Held last Monday afternoon and attended by interested Rotarians from our Rotary Club, District Governor Mike Juric, and DG Elect Helaine Campbell (Sebastopol Sunrise), President William said the meeting was partially successful with a compromise on the timeline of the increase from $39 to $55 per month per club. The discussion also included suggestions for improved communications between the district and member clubs. 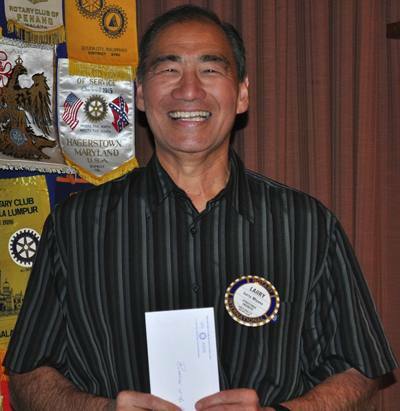 Larry Miyano received his well-deserved recognition for his outstanding work on behalf of our club’s Youth Exchange Student for this coming year. 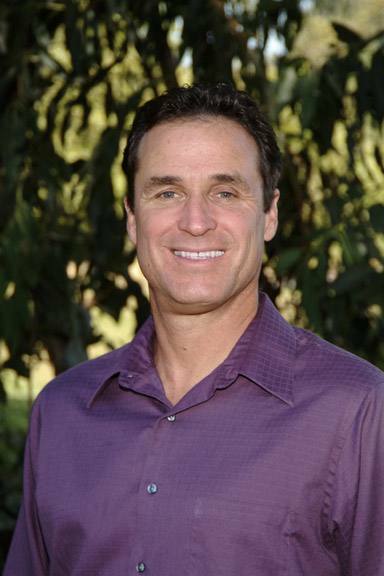 Wayne Rowlands was voted by the club’s board of directors for cumulative achievements and hard work on behalf of the Rotary Club’s innovative and outstanding website and the club’s digital image locally, district-wide, and around the world…literally! This prestigious award, named after one of our club’s legendary pioneers, was presented to another pioneer, Jeanne Levin. The Bostock Award is given for achievement, in recognition of a lifetime of service to Rotary. “Queen Jeanne” joined the Rotary Club of Santa Rosa in 1990, one of the first women admitted to Rotary and the first female president of our club. Jeanne became president in 1998, only 77 years after our club was chartered. Did you ever wonder why so many birthdays nine months after the coldest weather? Even with central heating? Ask Birthday Chair John McHugh, who passed out chocolate candy to all nine. 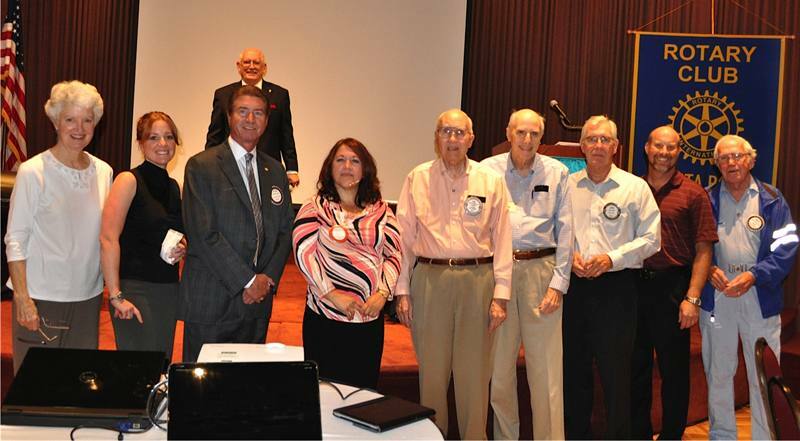 From left to right: President-elect Peggy Soberanis, Carmen Sinigiani, Steve Reuter, Manuela Gonzalez, Ray Foreaker, Jack Abercrombie, Jack Atkin, Ray Giampaoli and Nick Knickerbocker. In the background is Birthday Chair John McHugh. Rotary Magazine Challenge’s Debi Zaft announced that June is the last month to qualify for the $100 prize drawing by answering the Rotary year’s final question from the June issue. Debi also offered to all Rotarians the opportunity to promote vocational service, and your business, through the District Directory and District 5130’s website…advertising available at a serious discount. President Bill was running out of time at this week’s meeting but he still managed to zing Past President Steve Olson for being awarded the prestigious Presidential Medal of Honor from SRJC President Frank Chong. The time was right. Steve contributed $100 to his granddaughter’s Paul Harris Fellowship. Speaking of timing, our lame-duck Prez caught Steve Reuter with an extra $10 in his pocket from his missed chance at today’s Raffle prize. President William parlayed it into $50 for each Paul Harris Fellowship for Steve’s sons. Meet community, business, and professional leaders from all over the world and broaden your understanding of Rotary by attending the 2013 RI Convention in Lisbon, Portugal, June 23-26. The last chance to register online is June 15TH. When I entered the ballroom this week for the Rotary meeting, the first thing I noticed was a big cylinder on the stage. It looked like a cannon…but that was only the first new thing I learned—and saw—today. The subject was astronomy, and the “cannon” was actually a telescope, and it was empty inside. Linda Sinkay explained that it was a tube to shield the mirror inside from ambient light and hold eyepieces that astronomers use to look at the images reflected from the billions and billions of stars in the universe. It turned out that astronomers do not think much of the moon, Jim Goodenough explained that was because the moon reflects the light of the sun and lights up the night sky, making it very difficult to see all the stars and galaxies and “other worlds” that are millions of light years away, out there. 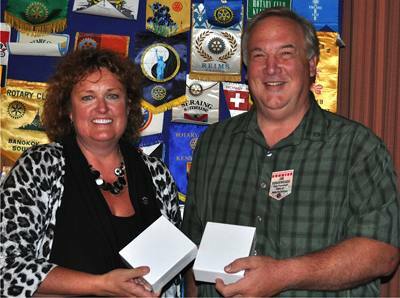 Both Jim and Linda are fellow Rotarians, members of the Rotary Club of Sebastopol Sunrise, and both are past presidents of their club. What a fascinating half hour this week, with so much to learn and remember: A “telescopic laser” that serves as a pointer, creating a visible green line that helps observers locate a specific object in the sky. We learned about Astro Photography, saw a “globular cluster”, and learned that two different kinds of nebulae exist—“ring nebula” and “veiled nebula”. Actually the generic category of veiled nebulae includes three individually distinct names: “lagoon nebula”, “Witches Broom nebula”, and the repetitive “veiled nebula”. We also witnessed photos of the “Transit of Venus” as a heavenly body moves across of the face of the planet Venus, and tried to comprehend the gigantic size of the Andromeda Galaxy, which covers 2.5 million light years of the universe! 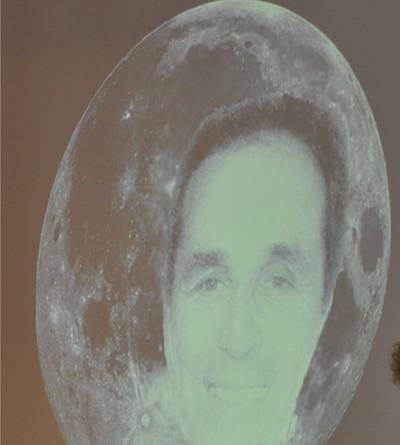 Finally, proof the man in the moon is real! And, last but not least, we decided to visit SRJC’s Robert Ferguson Observatory and make a note to watch for a newcomer coming soon to our part of the universe on November 28 & 29, when the Comet Ison passes 800,000 miles from the sun.